Lovelee UK sells the most beautiful girly hair bows and headbands. Cheri mainly focuses on making them for children but she does do them for adults so I couldn't resist. I have an inordinate amount of hair bows but these ones are so so beautiful I gave in. So the first bow is a rose pink glitter bow which is attached to an alligator clip. The glitter material is super thick and amazing quality. It feels so sturdy as well. How cute is it?! The second is a hair clip with a knotted bow made out of polka dot Cath Kidston fabric. This is SO adorable, I'm beyond pleased with it. To be honest, I'm in heaven with this order.. you guys know how much I love pink. The third item is an elasticated headband with a pink felt bow and gold detailing. Wow, this is beautiful. The felt and the glitter go so well together and I just loooveee how it looks. Cheri posts photos of her creations on Lovelee UK's Instagram so go check her out on there. 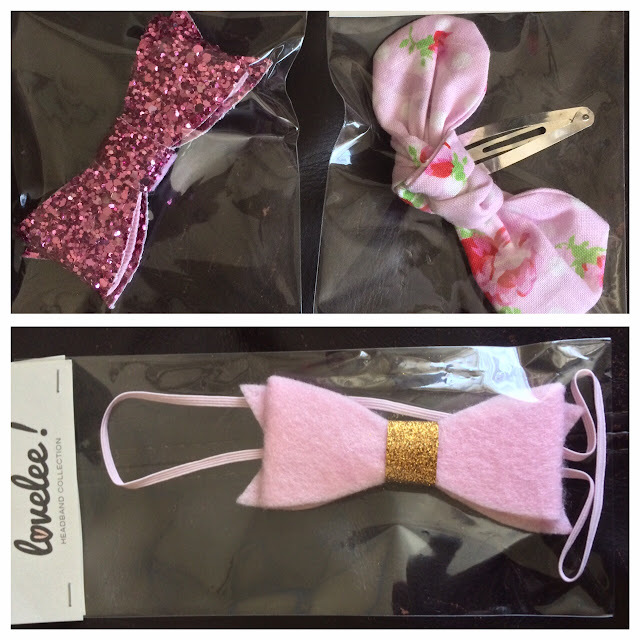 I would definitely recommend Lovelee UK if you are into hair bows or have a little girl who is. They are of superb quality and are unbelievably cute.